Chhole is one of the most famous north Indian vegeterian dish. 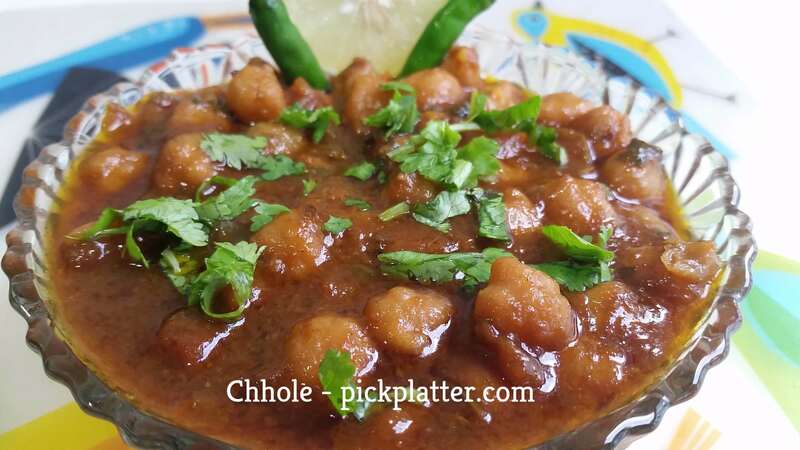 Chhole is basically Chickpea cooked in Indian style curry. It is also called as Punjabi Chhole or Chhole Masala. Chhole is the best accompaniment of bhature, puri and rice. Chhole Bhature, Chhole Puri and Chhole Chawal are the most famous Chhole dishes. To make Chhole you have to soak chickpeas/kabuli chana for 6 to 8 hours. In my recipe I have used soaked chickpeas directly. You can also first boil chickpeas and add with cooked spices. But I prefer without boiling one method. I cook spices with chickpeas and lastly pressure cook it, so get very nice flavor of chickpea curry. For perfectly puffed restaurant Bhature Recipe Click here. Heat 3 to 4 tbsp oil in a pressure cooker. Add 1 tsp jeera, 4 cardamom, one of inch Cinnamon stick and green chilies. Add 3 to 4 thinly sliced Onion. Cook till Onion turns golden. Add soaked Chickpea / Kabuli chana. Cook it for 4 to 5 with stirring at intervals. Meanwhile Take 2 tbsp ginger garlic paste in a bowl. Add 1 tsp turmeric, 1 tsp chili, 1 tsp coriander and 1 tsp cumin powder. Add some water to make a thick paste. Now add prepared spices paste to chickpeas. Now cook it with continuous stirring till spices are cooked and oil starts separating from it. Now add 1 chopped Tomato and Salt and cook till tomatoes become soft. Once Tomatoes cooked completely, add 2.5 cups of water. Add 1 tsp garam masala powder and coriander leaves. Now cook it till 2 whistle. Then switch off the flame and let it set for 5 minutes. Open pressure cooker and serve Chhole garnish with fresh coriander leaves, chopped onion, lemon slice and green chilies.